Once upon a time, a person walking about randomly yelling “Marco” in public would have likely inspired concern that they had lost their son of the same name – or were just very strange. That was before longtime Mississauga resident and independent application developer Matt Wiechec came along with his top-selling iPhone-locating app – aptly called Marco Polo. 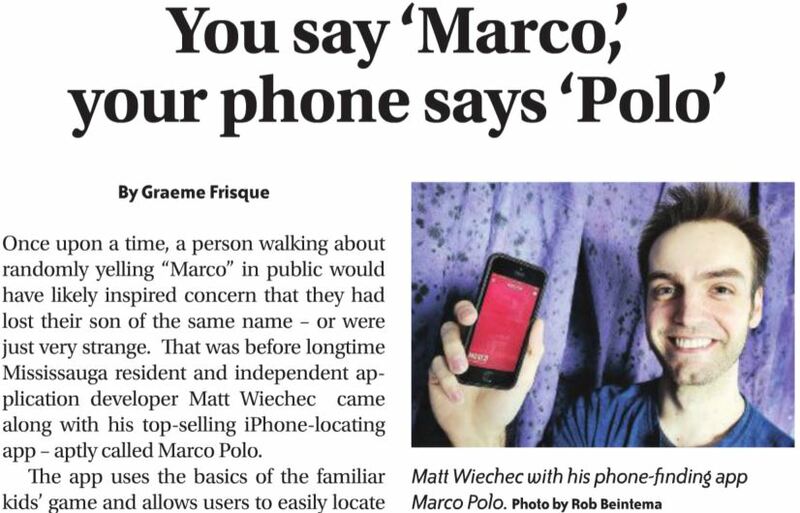 The app uses the basics of the familiar kids’ game and allows users to easily locate their misplaced device by simply calling out the word “Marco.” The phone will then reply with – you guessed it – “polo,” bringing lost phone and owner together like a couple of giddy kids playing in a pool. “The idea was separate from the theme. I misplaced my phone one day and thought, ‘wouldn’t it be cool if I could just ask where my phone is,’” said Wiechec.